Texas Silencer Company was formed by a group of hunters and aerospace engineers to develop precision made silencers for the hunting community and the millions of recreational shooters across America who need a friendly silencer manufacturer they can depend on, and a product that will never let them down. We at the Wendy Lou are very enthusiastic about "The Hunter" and believe the company's motto that "once you hunt with it, you'll never hunt without it"! The folks at Texas Silencer are fully dedicated to the American hunter and all of the silencers are designed and built entirely at their facility in Weatherford, Texas with pride, and a fanatical devotion to making the hunting experience safer and more enjoyable at a price that's fair. Read more about this superior silencer HERE. 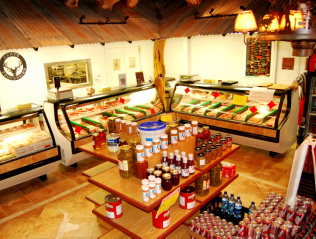 We are happy to refer you to our friends at Clay's Deer Processing and Smoke House. Clay's is a family owned business, that will meet all your animal processing needs. Convenient to the Wendy Lou, they are located in Dublin, and have been serving Texan's for years! Hunting is an annual tradition in these parts and they want you to make the most of your harvest. Stop by Clay's to check out their new store where you can pick up their terrific line of bbq rubs and hot sauces. Drop off your deer and choose all your cuts, definitely consider having some hot links and brats made up - they are fantastic, as well as jerky and deer bacon. Clay's has a 24hr drop-off cooler on the west side of the building, and you can print your order form off the web ahead of time, allowing your family to choose what they would like in advance. Visit Clay's website using THIS LINK. Tell them the folks at Wendy Lou sent you! 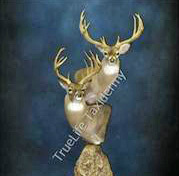 Roy Holdridge and his staff at True life Taxidermy in Granbury specialize in custom taxidermy for the sportsman who desires a unique, high quality way to preserve and display trophy animals. Roy's passion and artistry is on display in his museum-like 1800sq ft trophy room, and in his extensive list of awards achieved in the greater than 25 years he has been involved in taxidermy. You'll also see examples of Roy's work adorning the walls of our lodge. Our friends at True Life are our choice as the finest taxidermist in the area to transform your animal into a natural and realistic trophy. Visit their website by clicking THIS LINK. Click THIS LINK for more information on hunting licences, including purchasing them online.